"PlayMemories Home" enables you to manage and edit photos and videos on your PC. Let's start with importing photos and videos to your PC! "PlayMemories Home" allows you to import photos and videos which you took, to your PC. 1. Connect your digital video camera, digital camera or smart phone to your PC, etc., using the supplied or built-in USB cable. Or, insert an external medium like a SD card or "Memory Stick" media into your PC. The following screen will automatically display. 2. ”Select "Import Media Files". A screen that guides you to import photos and videos will appear. 3. 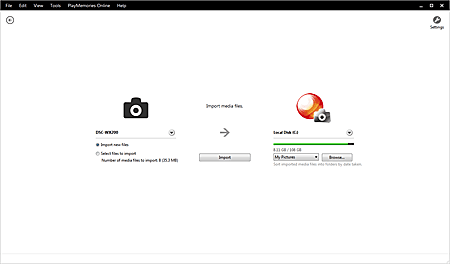 Import photos or videos by following the on-screen instructions. - When the All Sync function is on, imported photos are automatically uploaded to "PlayMemories Online" after importing. Photos uploaded automatically are not open to the public. Signing in "PlayMemories Online" from "PlayMemories Home" allows you to also view and edit photos from "PlayMemories Home" that have been uploaded to "PlayMemories Online". You can also share uploaded photos and videos with your friends and families from "PlayMemories Home". 1. From the [PlayMemories Online] menu, select [Sign in].